Breath-taking views, soft golden sandy beaches, azure seas, gorgeous balmy breezes and stunning sunsets. 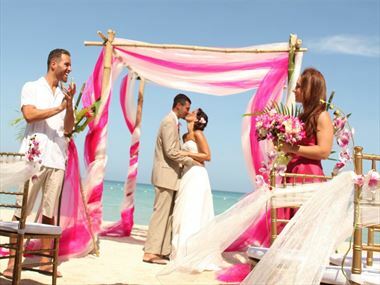 The romance exuded by the quintessentially-Caribbean Bahamas makes it perfect for your unforgettable wedding. Choose to exchange your vows on a secluded beach on one of the outer islands of the Bahamas, or say “I do” on the beautiful coastline of New Providence, just minutes away from the cosmopolitan excitement of the capital of the Bahamas, Nassau. Wherever in the Bahamas you choose to have your wedding, the abundant tropical flora provides the perfect backdrop to your ceremony. Imagine a colorful riot of bougainvillea and other bright tropical plants filling the air with their scent as the breeze floats ashore from the ocean. Explore the historical architecture of Nassau by day and enjoy its vibrant nightlife once the sun has gone down. Indeed, time your wedding right and you may be in Nassau for the street celebration of Junkanoo - an unforgettable experience.